Most often, Tarragon wears a black suit with a grey waistcoat and a pair of horn- rimmed glasses. "A specialist in American culture or history and in the languages or cultures of the aboriginal inhabitants of America." Notably, Tarragon is the author of a thesis about the occult sciences of Ancient Peru. 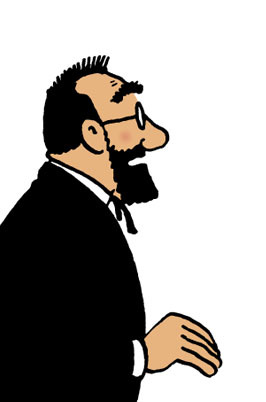 It is said that when he created Professor Tarragon, Hergé was inspired by Jean-François-Désiré Capart, illustrious Egyptologist born in Brussels on February 21st, 1877. Mr. Capart gave lectures at numerous Institutes and Universities. He was also Chief Curator at the Royal Museum of Art and History in Brussels (1911). It is to be noted that when Jean Capart travelled to South America (1936) he visited various museums and focused his interest on the exhibits about Indians. The journeys of Jean Capart are recounted in a book, "Jean Capart ou le rêve comblé de l'Egyptologie", written by A.-M. Capart, a member of his family. On February 5th, 1975, Hergé wrote to A.-M. Brasseur Capart to praise her for her book. Tarragon was part of the ethnographic expedition which discovered and brought back from Peru the mummy of the Inca King known as "He-who-unleashes-the-fire-of-heaven". Tarragon is "the last of the seven" (in reference to the other six members of the expedition). Will he evade the spell cast on the various members of the Sanders-Hardiman Ethnographic Expedition by a strange "fanatical Indian" who "has sworn to punish those who were bold enough to disturb the tomb of the Inca king, Rascar Capac"? Tarragon was Calculus' fellow student. Although they both studied together, Calculus was never known as an Americanist. ; In Tarragon, one could also see the precursor of Doktor Grossgrabenstein in "The Mystery of the Great Pyramid" from Edgar Jacobs.